Hannibal’s PATENT PENDING engineered solution provides dual moment resistance in both down aisle as well as cross aisle direction. This engineering breakthrough results in as much as 50% reduction in uplift on the footplate to slab calculation, significantly lessening slab uplift design requirements in all facilities, including installations open to the general public. STRENGTH to Weight- TUBE RACK’s A500 Grade-B structural tubing design utilizes the same structural tubing used in building columns and bridges. STRAIGTNESS- Structural tubing provides up to TWICE the straightness tolerances of structural channel as defined by ASTM specifications. MODULAR DESIGN- TUBE RACK provides a modular design making racking configuration changes or repair simple and extremely cost effective. Both height and depth of the design can be altered affordably and with little effect on ongoing operations. SHIPPING COSTS- TUBE RACK allows for maximum weight over cube, providing an average 35% savings in shipping costs. IMPACT RESISTANCE- Hannibal’s TUBE RACK offers up to ¼” thick welded shapes with dimensions up to 4”x 4” providing the highest impact resistance in the business. FIT and FINISH- Hannibal’s TUBE RACK provides for smooth and flat surfaces allowing significantly superior powder coat coverage with little or no mill scale chipping. This system simply looks good. SAFETY ABOVE ALL- TUBE RACK provides the safest working and shopping conditions for your employees and customers. Our design significantly lowers the potential of product shed in a seismic or impact event. 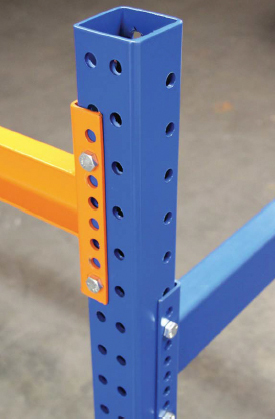 The ½”, Grade 5, bolted connections eliminate the potential of a broken horizontal or diagonal brace going undetected in a typical existing racking system. This safety benefit of Hannibal’s TUBE RACK is the one of which we are most proud to bring to our market.